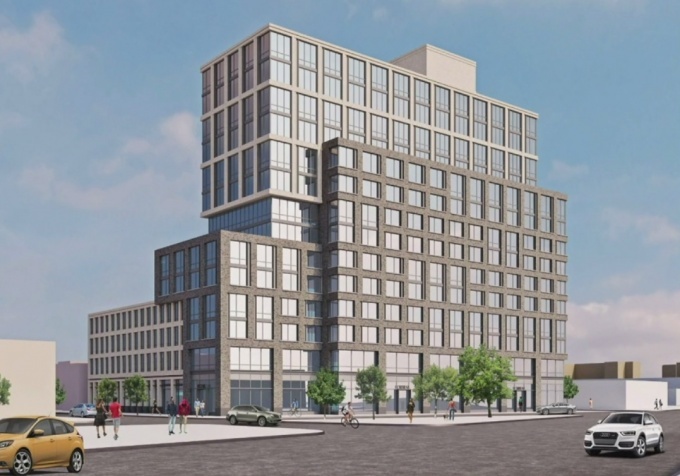 Community Board 1 resoundingly rejected a rezoning application earlier this week that would allow for a 14-story building to replace a string of businesses off 48th Street and Northern Boulevard. 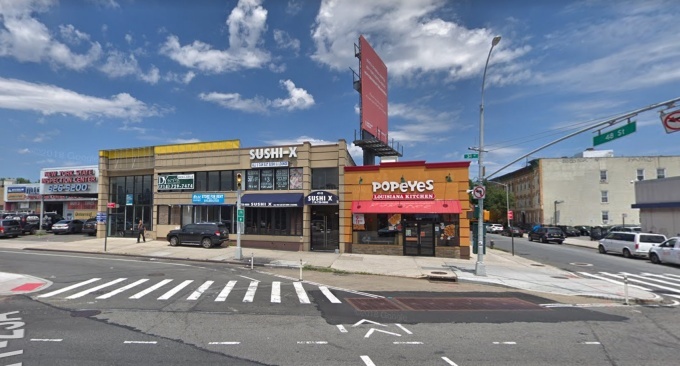 The board, in a vote of 31 to 4, opposed plans put forth by developers Ashley Young LLC and John Young LLC for a 201-unit project at 47-15 34th Ave., currently home to businesses like Popeyes, Kumon and more. This decision, made during the Jan. 15 board meeting, comes even after the developers slightly tweaked their plans with suggestions made by the board’s land use committee earlier this month. 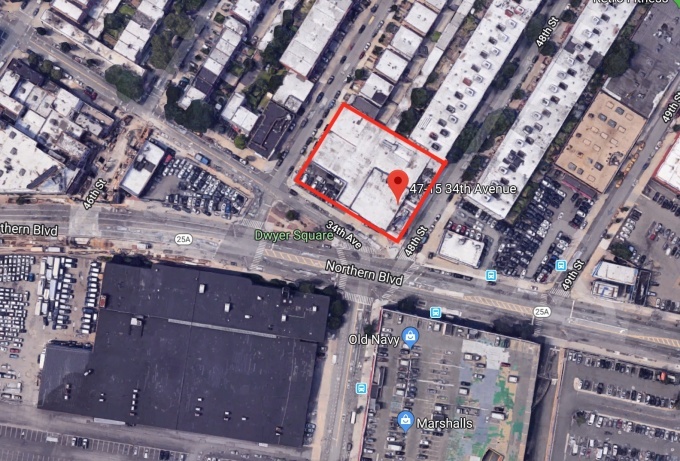 The proposed project calls for an approximately 183,000 square foot building with ground floor commercial spaces along 34th Avenue and wrapping around 47th and 48th Streets. The building would also be made up of units ranging from studios to three bedrooms, with 61 units, or about 30 percent of the development, set aside for households earning 80 percent of the Area Median Income. A family of three, for instance, would need an income of $75,120 to qualify. But the plans require the site, which only permits for commercial buildings as seen today, to be rezoned not only to allow for housing on the lot, but for a building of the proposed size. Without the application’s approval, which has already proven to be polarizing as it moves through its public review process, the developers would be limited to a project similar to the one and two-story commercial buildings in place today. 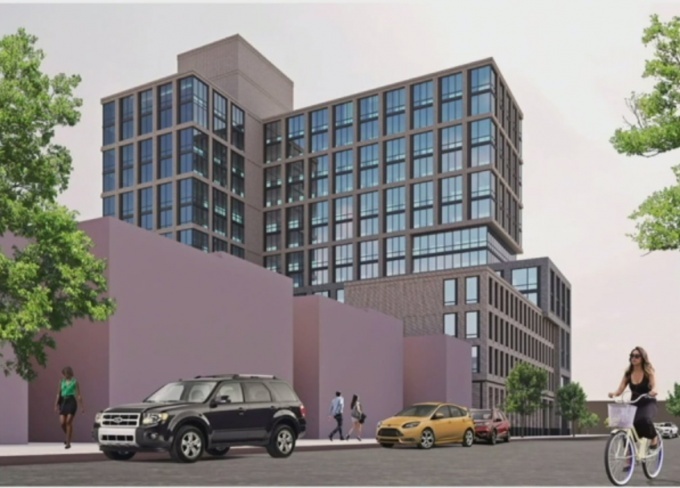 The board, along with many attendees at the Tuesday meeting, spoke to fears of a gentrifying neighborhood, an out-of-place building, and the affordability of the units in the proposed project. While the proposed building maxes out at 14 stories, it tapers to heights of six and four stories throughout. The taller portions of the building are toward Northern Boulevard, while the back of the building shrinks in size to correspond with the low-rise residential homes there. Some also questioned the rezoning area’s parameters in the application, which extend to parts of the adjacent block between 46th and 47th Streets. The portions of the adjacent block are not owned by the developers and are not part of the planned development, but were included in the application at the request of the City Planning Commission. Only rezoning the development property would create a “donut-hole” situation for the adjacent block, which would be stuck with an out-of-place zoning if not included in the plan. “I don’t know why they would be allowed to [rezone the entire block] unless they plan to buy more of that block in the future, which would gentrify the area.” said Mark Pavish, an Astoria resident. The board also learned that the developers had drawn up a new unit distribution plan after the Land Use Committee recommended that they up the number of larger units for the project in a Jan. 9 meeting. The prior plan called for 104 units, or 52 percent of the development, to be one-bedroom apartments. The developers also planned for 63 two-bedroom units, 32 studios, and two three-bedroom units on site. The new plan drops the number of one-bedroom units to 99, and ups the two and three bedroom units by four each. Studios were also dropped by four. The changes, however, were ultimately not enough to win over the board. In its no vote, the board recommended that 35 percent of the units be affordable, and that the income eligibility requirements better fit the levels already seen in the area. The board also called for a building that would be between eight to 10 stories and no more. Not everyone was opposed to the project outright. Bishop Mitchell Taylor, executive director of Urban Upbound, said the non-profit was promised a space within the development, and that it would better serve the community. The proposal now heads to the Queens borough president’s office for review before eventually heading to the City Council for a vote. Council Member Jimmy Van Bramer, who represents the area where the project is proposed, said he is taking heed to the board’s decision. Not really. He is all for sound development as long as it contributes to the community. Don’t bash your politicians without any evidence. Affordable would be great WoodSider, but their definition of “affordable” is $2,000 a month for a studio apartment. The whole “affordable housing” lottery thing is a sham. It’s so ludicrous that there are developments in Manhattan where they have a hard time filling the “affordable” units because they are too expensive for people that fit in the income guidelines. That is pretty much expected. Building is way out of context for a low rise residential area. No doubt the developer will reduce the bulk and try again within the next few months. Good. Ridiculous the rents these places want to charge. The rent for a one bedroom apartment should be $700 or so for special affordable housing at most not thousands of dollars. All communities should have stood their ground on zoning approvals years ago. Astoria and LIC would still be an affordable place to live for families. I’m glad the CB is finally standing their ground but it’s a little late.